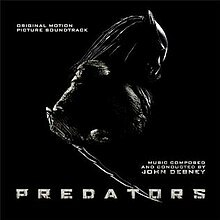 Predators is the official soundtrack album of the 2010 science fiction film Predators. It was composed by John Debney and released on July 5, 2010 via La-La Land Records. The score is completely orchestral and makes use of several themes from the first two films by Alan Silvestri. The main "Predator"-theme plays for the first time in the film when the Predators first appear. Later it is used at several points throughout the film. Whether you like this or not depends on one thing: Do you like Silvestri's previous scores? I have to say no to that question. The theme is the only thing I enjoyed from it and luckily that is still here. I hated the drum sequence from Predator 2 by the way and it's still here haunting me... The new updated theme for Predator is fun, and there's some good action material here to be fair. An excellent score for Predators the movie, a boring listen outside of it. John Debney did a fantastic job on this it has to be said. He went above the call of duty and created a score exactly what the film needed. Ultimately, PREDATORS was a good re-make film with a serviceable sound design-y score, but it came from a man with the talents to produce something far better. Such a film deserved a score that was not only very effective against the picture — which DEBNEY’s effort undoubtedly was — but also offers listeners engaging material on album…which I have my doubts about. Next time, perhaps?